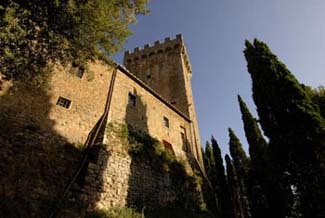 Built in the 13th century, the feudal holdings of Gargonza bounced between rival Sienese and Florentine families until the 16th century, when Marquis Corsi, ancestor of the current owner, acquired the property. Of military importance, Gargonza appears on a military map by Leonardo da Vinci. The most historical event during Gargonza’s history was the arrival in 1302 of Dante Alighieri, who sought refuge here after his exile from Florence. A plaque over the archway was erected in 1922 in honor of his residence. The most compelling story of the village’s history, however, takes place in our time. After World War II, villagers left Gargonza, to seek life elsewhere, and by 1970 only a few people were left. With vision, Count Roberto Guicciardini Corsi Salviati saved the village from the brink of ruin by investing in its preservation, creating a living history for visitors who shared his passion. Gargonza is once again a vital entity on the Tuscan landscape. If you are mobility impaired in any way, please discuss your situation with the management at the time of booking. Many of Gargonza’s accommodations are reached by steep stairways. If you are an artist or writer seeking a retreat to get that project finished, you might take notice that Italian director/actor/writer Roberto Benigni came to Gargonza to work on his screenplays for Life is Beautiful and Pinocchio. Reputedly, he only came out to eat, and management kept the journalists away. Yes. A small 13th-century church with a 15th-century fresco is on the property. If you ever have wondered about life as a feudal lord with your own village to preside over, the Castello di Gargonza comes close to the perfect experience. Time and the modern world has long ago passed by this tiny, fortified, medieval, agricultural village with its massive walls and crenellated tower. Through a stone archway into a small piazza, radiating streets are lined with small houses with geraniums cascading out from arcaded balconies; these are your accommodations. Houses maintain the integrity of the original structure, with locally crafted additions, such as Tuscan red tile floors and ceiling beams hewn from nearby chestnut trees. Bed-and-breakfast or self-catering arrangements scattered within the village or just outside the walls are offered. The character and charm vary among the rooms and apartments: some have fireplaces and/or terraces; some are built into the wall, while steep, narrow stairs lead to others. Kitchens are decently equipped, and a well-stocked grocery store in nearby Monte San Savino will provide just about everything you’ll need. If you’re a bed-and-breakfast guest, or just don’t feel like cooking, the Torre di Gargonza restaurant (the tagliatelle pasta with wild boar meat sauce sounds incredible) is just a few steps away. An old olive press building serves duty as a public area for breakfast and bar; adjacent is a room for lectures and concerts. Of course, the modern world has crept in, the swimming pool as an example, but it remains outside the walls. And what could be more delightful than an evening swim with the lights of Cortona twinkling across the valley? The entire medieval village is available for hire—weddings, reunions, cultural events, conferences.